What if I told you that car makers never drove their autos, let alone take them to test tracks to see what they could really do? What if I told you that car makers never really paid any attention to what customers said about their autos after driving them for awhile? What if I told you that car makers never noticed that people were taking off the supplied wheels and putting on different ones, almost universally? Now that we’re in the Long Slump and it’s still unclear where the bottom of the sales decline will end, you’d think that the camera makers would be paying attention. Unfortunately, they’re still behaving like my hypothetical car makers. Let’s start with the last example I mentioned (people taking standard wheels off and putting new ones on). Does this happen with cameras? Oh you bet it does. Be truthful now: when was the last time you actually screwed something into the tripod socket on the bottom of your camera? Oh, and was that thing a quick release plate? ;~) Bingo. So why do we still get only tripod sockets from camera makers? Well, they don’t make tripods ;~). A tripod socket is a part that costs them a few cents and basically lets them punt stability problems to other organizations. Meanwhile, tripod collars on long lenses have…tripod sockets on them. Have you ever seen someone screw a Nikon 300mm+ lens onto a tripod? Ever? So why do those tripod collars have tripod sockets on them? Because no one is paying any attention to what the customer is doing. In essence, we’re taking the standard tires off the car and replacing them the minute we get the car. Aside: hey Nikon, I can’t even screw an Arca plate into my 70-300mm CX lens because you still haven’t filled backorders on the tripod collar with the tripod socket in it. Can you say Double Doh!? Oh, we have a few minor signs that someone in Japan has seen what we do. Fujifilm actually makes one grip with an Arca-style plate at the bottom, and Sigma has recently said they’ll produce a new tripod foot for their 150-600mm zoom with an Arca-style plate. But where have these folk been for 30+ years? Certainly not in the field. I don’t ever recall seeing a product manager or engineer for a Japanese camera company in the field, even when I was shooting in Japan. 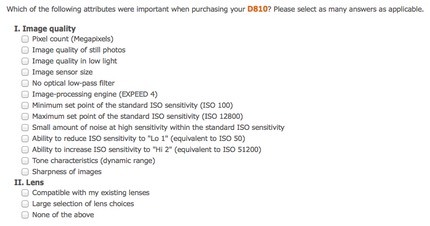 Technically, virtually all of the attributes that Nikon asks were “important” are probably important ;~). They appear to be trying to get to which were the most important, but they fail to ask that in one of the two primary and well-established ways (e.g. rate on a scale, select the top X attributes from this list). 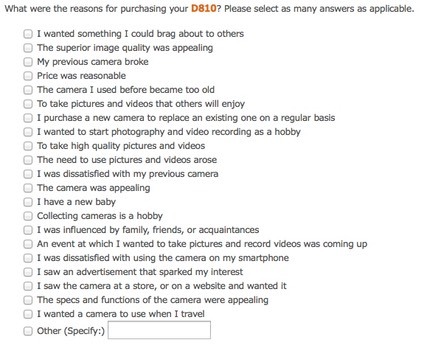 They do get around to asking you whether you’re satisfied or dissatisfied with the entire list of things they already asked, but by the time they do, the respondent will have survey fatigue, and the narrow set of choices (satisfied/dissatisfied) probably doesn’t really capture what Nikon needs to know. Of course, the survey I’m referring to wasn’t actually done by those designing cameras and making decisions about them. It was done by a subsidiary, possibly at the bequest of the parent company, but also possibly for political purposes by the subsidiary. And the data has to be translated into Japanese. It’s a long slow process for data to get back to where it needs to go. Funny thing is, I learn an awful lot about camera users by doing just two things: picking up their camera and seeing how it is set (all defaults, really? ;~), then watching them use it. I can see what frustrates them and what they take for granted. Surveys don’t tell me nearly as much useful information. So ask yourself this: how many of those involved with product development in Japan are out in the field actually watching what real users do with their products? Heck, how many of those engineers actually use the product themselves? A few camera makers listen to a few photographers. For instance, Fujifilm clearly developed relationships with a few of their early adapters of the X cameras, and seems to be listening to those folk relatively well. Of course, now you’re going to get cameras that are tuned for those pro users’ needs, not necessarily your target customers’ needs. Leica seems to listen well, too, though they don’t always seem to solve the problems they hear about. It’s time that the camera makers get closer to their customers. The good news is that there will be fewer of them to get closer to ;~). The bad news is that they don’t speak Japanese and don’t live in Japan. I’ll repeat an invite I made before: I’ll happily take a small group of actual camera gear designers and product managers on one of my workshops (or an event pre/post workshop that duplicates it) to show them what actually happens in real use. I think that with some of my trips the designers would be shocked at how gear is used and treated. They’d certainly be shocked at how many of the things they designed we don’t use. And how much of our time is spent not with the camera trying to deal with workflow the camera could have made better. It’s time the camera companies start doing what any good company should do: get closer to its customers. They need to do this before they don’t have any customers to get close to.